When I think about all of the phrases, anecdotes, and sayings about the power of the spoken word I am reminded of how I changed my way of communicating with children upon learning Play Therapy principles. I realize that using Play Therapy based language is a learned and practiced skill that requires time and effort, so I thought it would be helpful to share ten commonly used phrases parents say to their kids. I will also give the Play Therapy based alternative with a short explanation of why it is more effective. 1. No (running, hitting, yelling, fill in the verb)! 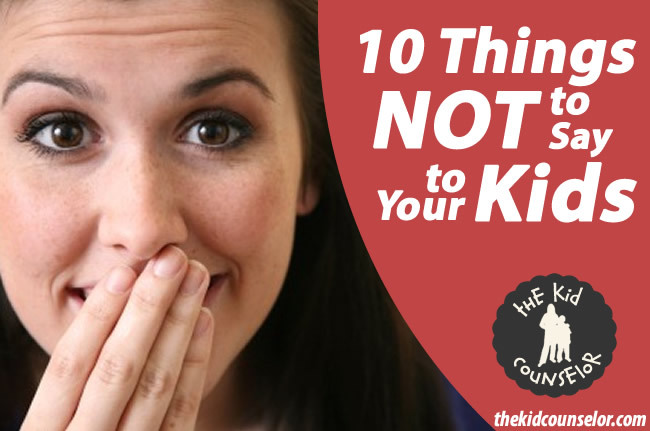 Kids hear the word “no” far too frequently (Read more about that here). You can always rephrase the sentence from a negative to a positive, which will correct the behavior without sounding critical. Train yourself to say what you want them to do instead of what you don’t. So, you can say “Walk, please” instead of “No running”. I have spent a good deal of time on articles on the difference between Praise vs. Encouragement, and this phrase is arguably the most commonly spoken praise children hear. Train yourself to respond with “You did it!” or “You got it!” or “You figured it out!”. Notice the common element is starting with the word “you” and then acknowledging what they worked at, rather than what you think about it. 3. Don’t argue with me. Children are programmed to question, analyze and wonder about situations. This can sometimes present itself in an argumentative manner, but this is actually a normal part of development. Instead of cutting off the conversation, you can say, “I know you want my answer to be different, but it will not change”. You can also train yourself to make sure the child fully understands your response, with “I just told you my answer. Do you have a question about it?” This allows the child to present their opinion or get clarification. Either way, the child is allowed to express their thoughts or concerns and feel validated without an argument. 4. Wait until your Dad/Mom/other person finds out about this. This does two things. First, it creates anxiety and fear in the child, especially of the person who you are going to tell about whatever happened. Second, it ignores your responsibility to deal with the issue at hand and passes it to someone else. By the time a child has gotten in trouble for something, they already feel guilty, sorry and embarrassed about it. Threatening to tell someone else rubs salt in the wound. Choose whether the other person really needs to know about the issue, and if yes, let the child decide who will tell them. “Do you choose to tell (Mom) what happened, or choose for me to tell her with you there to make sure that I explain it correctly?” This gives the child respect and responsibility for their actions. I can’t tell you the number of times I hear that phrase when around other parents, even though it is highly ineffective. First, you are threatening a child, which makes them fearful of you. Second, the threat is usually not something that is feasible to do (we are going home, you are going straight to bed, you don’t get dinner, you are grounded for a week, etc.) What we say in frustration is not only impractical but easily forgettable. Then we contradict our credibility. You can train yourself to be clear and concise, using choices. “If you choose to (continue that behavior), you choose to (receive whatever consequence has already been established as a punishment)”. You might say, “Erin, if you choose to poke your sister again, you choose to not watch TV for the rest of the day”. This clearly communicates the expectation and the consequence, without a threat. 6. You are doing that the wrong way. Parents tend to want control all of the time, and it takes work to allow kids to have freedom to do what they choose. Of course, there will be times when a task must be completed in a certain fashion (homework, etc.). However, many times we force kids to do something the “right way”, when it could have been done in several ways. If a child is coloring the grass purple, it is easy to tell them it must be green. A kid can sit down on a chair facing the back, and we make them turn around. Train yourself to acknowledge their behavior without a judgment, such as “You chose to sit the other way on the chair” or “You colored the grass purple instead”. This gives them the freedom to be creative and discover things without expectations. We often try to teach lesson to kids about life at the most inappropriate times. If a child gets hurt because they were doing something dangerous or inappropriate, they already learned their lesson. It is wasted words to try to express a rule when a child is upset, as they focus on one thing at a time. Instead, train yourself to say, “You realized that you jumped off the chair and got hurt when you landed on the ground”, rather than, “See, that is what happens when you jump off the chair”. The former acknowledges that the child already figured out the problem, but is still comforting. 8. You can’t/Don’t do that. When redirecting behavior, it is difficult to know how to phrase things in the best manner. Telling a child that they can’t do something makes them prove that they can, by telling you or showing you that it is in fact possible. Telling a kid to not do something makes them want to argue or rebel. Train yourself to explain the reason behind your statement. “That is not safe” or “Your skin is not for coloring on” is specific and helps them learn why things are off limits, rather than just that they are. 9. We are (whatever the child doesn’t want to do at that moment), OKAY? In an attempt to be kind and loving to children, parents tend to ask kids for their approval. I understand the rationale behind it, but I believe it becomes a habit when trying to convince a child to comply. Parents will often say, “We are leaving the playground now and we’ll come back again, okay?” The reality is that asking your child if it is okay sets you up for an argument when the child says no. You already know that he doesn’t want to leave, or you wouldn’t be negotiating with him. Train yourself to state things in sentence form, while acknowledging the child’s feelings. “Kevin, I know you want to stay and play, but it is time to go. We can come back another day”. This helps the child feel understood, but still communicates that leaving is non-negotiable. 10. You are making me really mad right now. When I was a child and fought with my younger brother, I would complain to my mom that he made me mad about something. She would (and still does) respond with “No one can make you feel anything. You choose to get mad.” At the time, I hated that phrase. However, it is very true. Parents tend to let their children control their emotions, when it is the parent who is ultimately responsible for how they feel. It is also important for kids to understand that they choose what they feel, and they are not creating emotions in you. Train yourself to say, “I need a break right now because I am getting upset” or “I am angry right now”. You can communicate your feelings to your children without placing the burden of cause on them. Retraining your way of speaking will take time and energy, but can be done. I would encourage you to do it one step at a time, and feel proud when you hear yourself respond differently. It will not happen overnight, as I liken it to learning a new language, but it can happen with practice!